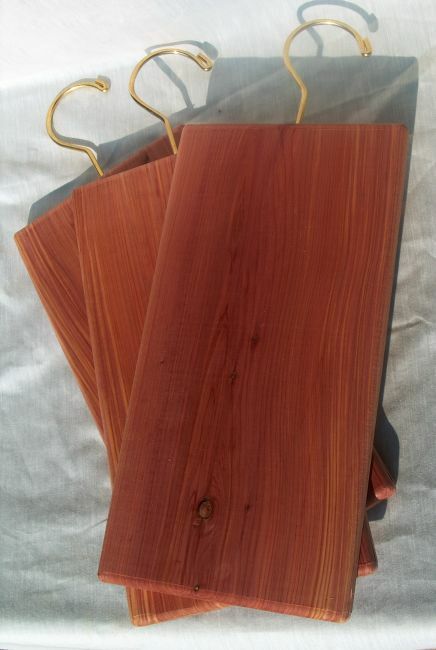 The strong aromatic quality of eastern red cedar makes for excellent closet items such as hangers and shoe racks. 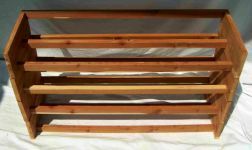 Cedar is also a wood that will not rot, thus making the perfect material to craft outdoor items such as planter boxes, picnic tables and wind charmers. The Graham family saws the cedar on their farm using a very efficient Timber King sawmill. The mill uses a blade much thinner than the old circular saws, allowing for less waste in wood. The lumber yield per log is 25% more than conventional mills. The cedar lumber is then dried and later used in the woodworking shop. Scrap cedar wood pieces and cedar shavings are bagged for the stuffed cedar blocks, shavings, and pet litter. 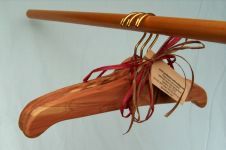 The Grahams also craft items from other local woods including pine, oak and maple. Those items include the pine trestle tables made from quarter-sawn lumber and round end tables and bar stools made from oak, maple and poplar. Coat hangers (16" wide ladies/children) - one piece cedar with brass plated hook. 4 for $15.50 plus $9.50 packaging & shipping ($25.00 total, set of 4). If ordering more than 1 set of coat hangers, shipping & handling is computed at an additional $3.00 per each additional set of hangers, please email us your order and we will email you back an invoice with the discounted shipping. 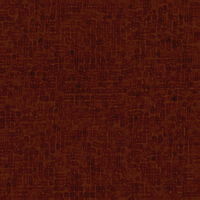 Cedar Hangups - Freshen up any closet! Hang 3-4 boards in a medium sized closet, spacing them evenly through the closet. 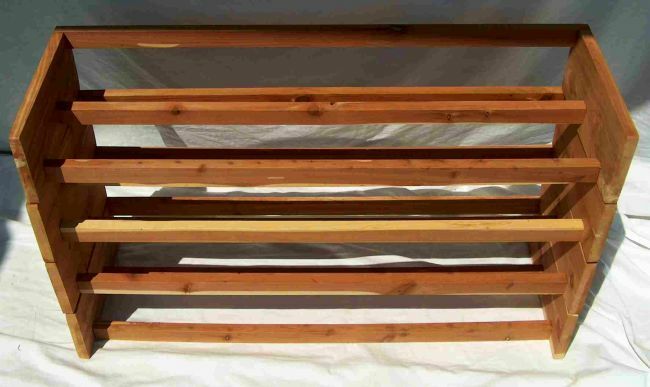 These cedar hang-ups are much larger than those found in a popular storage catalog. Boards will last for years! Lightly sand surface every few years to freshen up the scent. 3 for $15.50 plus $9.00 packaging & shipping ($24.50 total, set of 3). If ordering more than 1 set of hangups, shipping & handling is computed at an additional $3.00 per each additional set of hangups, please email us your order and we will email you back an invoice with the discounted shipping. 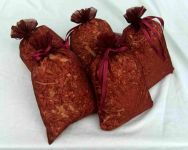 Organza cedar shavings sachets - aromatic cedar shavings in sheer organza fabric sachets approx. 6" x 9". Usually hung in closets or storage areas will impart a pleasant smell and reputedly repel insects. 6 for $24.00 plus $8.50 packaging & shipping ($32.50 total, set of 5). If ordering more than 1 set of sachets, shipping & handling is computed at an additional $3.00 per each additional set of sachets, please email us your order and we will email you back an invoice with the discounted shipping. Stackable shoe racks - Shoe racks measure LxWxH 36" x 11 1/2" x 5 1/2". These are easily arranged in closets to keep shoes organized and smelling fresh. Shoe racks are shipped disassembled to facilitate safe shipping. Just a few minutes is required to assemble one shoe rack, requiring only a mallet. Instructions and glue are included. When ordering more than one rack, the order will include dowel pins to elevate the racks for higher collared shoes (like boots) and to stabilize the racks when stacked. $23.50 ea. plus $12 packaging & shipping. If ordering more than 1 shoe rack, shipping & handling is computed at an additional $4.50 per shoe rack, please email us your order and we will email you back an invoice with the discounted shipping. (1 @ $35.50 total). 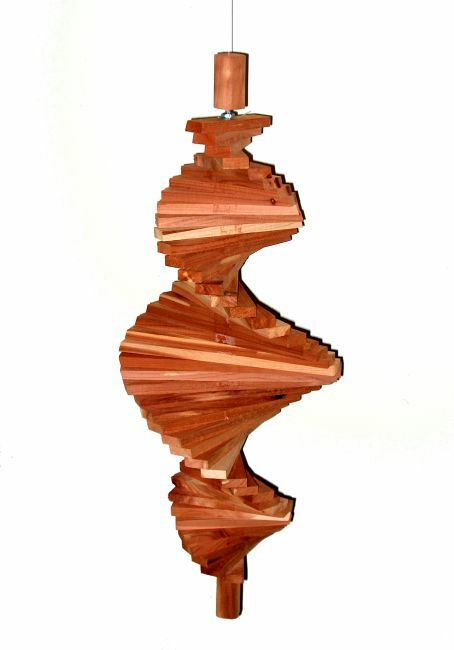 Wind Charmers/Spinners - These fascinating wind spinners are hand crafted from aromatic eastern red cedar. Spinning in the slightest breeze, they give the illusion of moving up and down. Children are really attracted to them. They measure18" long and 3" to 10" wide. The cedar is extremely weather resistant and should last many years. Hung on porches, they blend in nicely with potted plants. The wind spinners are shipped in a flat unspiraled configuration and can be unfurled in a few minutes without the use of tools. Instructions are included. $23.50 ea. plus $8.50 packaging and shipping. If ordering more than 1 wind spinner, shipping & handling is computed at an additional $3.00 per wind spinner, please email us your order and we will email you back an invoice with the discounted shipping. (1 @ $32.00 total). Fine Cedar Particles - The most aromatically potent of the cedar by-products is the fine cedar particles that comes from the band mill when sawing the heartwood, after the outer sapwood has been removed. We have bagged these particles into one-gallon plastic bags. 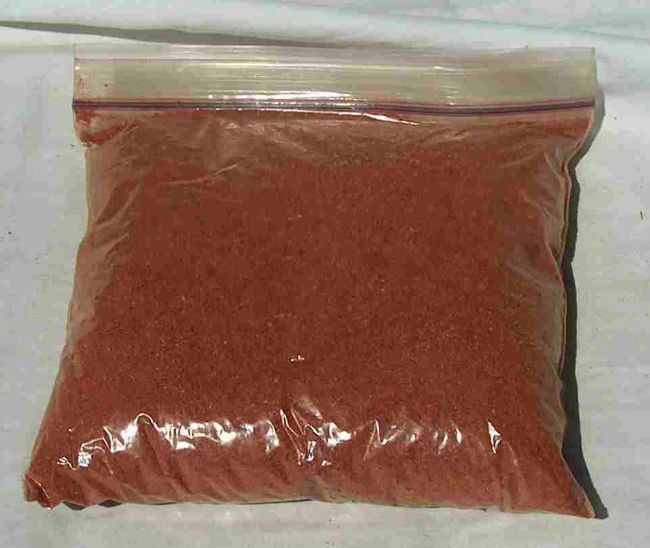 The particles can be used as incense, but more frequently, it is used as a proven natural insecticide for certain insects, like some pesky ants. The cedar particles can also be used as an air freshener bagged in hosiery material or simply spread in the bottom of a drawer or box then covered with napkin-type material. 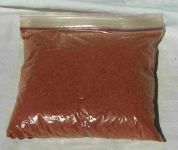 These heartwood particles are offered at $10.00 per one-gallon bag plus $8 packaging & shipping. If ordering more than 1 pkg., shipping & handling is computed at an additional $3.00 per pkg., please email us to verify total price. (1 @ $18.00 total).